So I committed to doing this blog and tried to think of some ideas in advance knowing that when April came along, I'd be quite busy. And sometimes busyness squelches creativity. I have to schedule a moment from my brain to wander free in order to pluck inspiration, and then write. But when April 1st arrived, I forgot until I saw an email from a friend who is doing the challenge too. This was dinner time with a whole evening of busyness ahead of me - no good material was going to come out of me for an entry! So hence my first post for "A". But because I said I was going to do something, I must do it and I did. Better to stand up and say I am here, but I am not prepared, than to cower away in an unknown absence. (Even though there is only a tiny crew of people who read this blog... that is beside the point- do the right thing even if no one is looking :) So for C - commitment, character and creativity. Creativity - allow time to be creative. I like this because it reaches out to all those who say they are not creative. It broadens the definition of creativity away from the arts that we automatically think of - painting, song writing, etc. There is so much to being creative and so much benefit. Find your niche! Hi, visiting from the A to Z challenge. 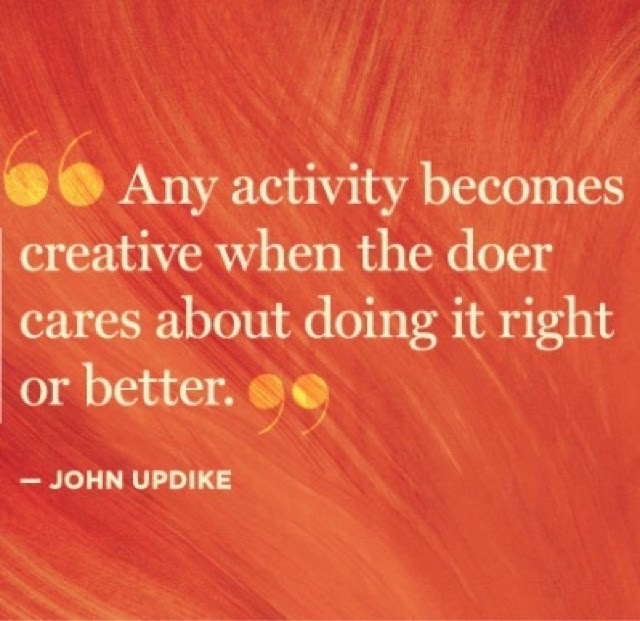 That is a lovely quote, and something I tend to feel very strongly about, what is the point of doing something if you are not trying to do it as well as you possibly can. Minion Carrie dropping by to cheer you on! Keep up the excellent work! :D Enjoy your day off tomorrow and have a blessed Easter! "It's impossible to explain creativity. It's like asking a bird, 'How do you fly?' You just do."